My body was sore from all the Physical Abuse I received from my personal training. It was god-sent when I was invited to Luxe Women’s Blogger Party. After all my body could do with some tender-loving care and pampering being offered by the award-winning nail-trending salon. In this present age, manicure and pedicure are no longer the exclusive right of women. More men are jumping into this business of personal grooming to get professional assistance in taking care of their nails. 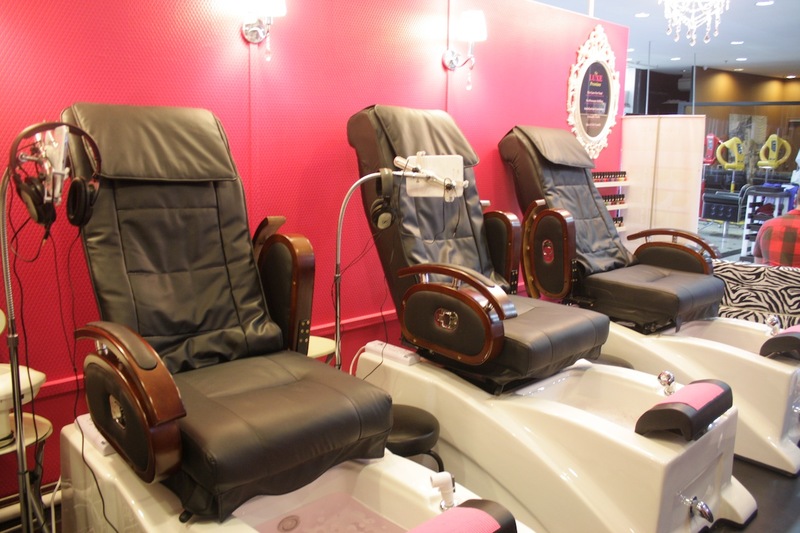 But if you’re an Alpha male and nails treatment is not your kind of pampering, fear not, because Luxe Women’s new outlet at Sembawang offers integrated services for both men and women to enjoy. Conveniently located at Sembawang MRT, this shop within shop inside Station33 is an one-stop service centre that combines spa, nail care, eye brown services, waxing (for women only), hair styling and massage all in one unisex salon. It is an ideal place for couple living in the north to spend half a day pampering their body and soul together. 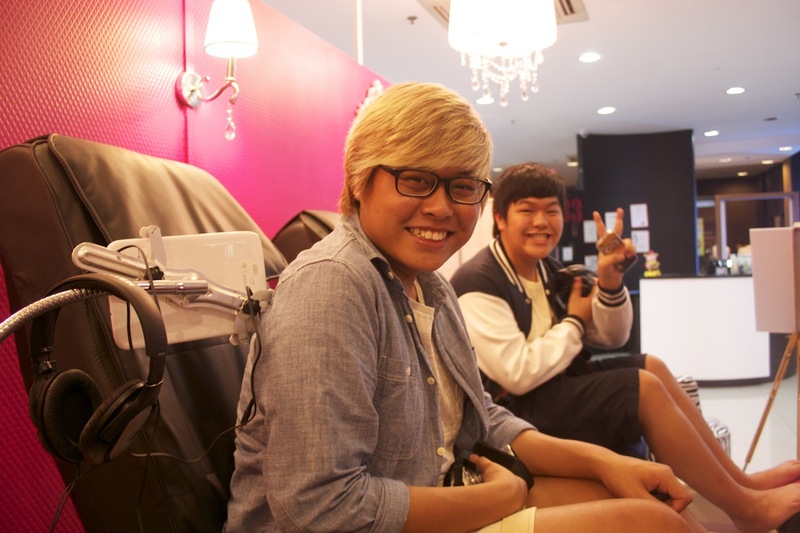 Last week, together with male bloggers, Damien and Don, we had the chance to experience i-SPA – soaking our feet in the 7 colour LED Jacuzzi Foot Bath Therapy while our body relax to the tune of the massage chair. The treatment was completed with Aroma-scrub and Mask with comfort and relaxation of a tablet with a range of movies to keep us entertain while the therapist worked on removing dead skin from our feet. After a quality feet treatment, we were ushered to ZuYue Foot Reflexology where our feet were kneaded by trained therapists who ensured that the pressure on our feet were just right. There is also a tablet attached to every chair and I was watching Captain America while getting the reflexology done. The session was completed with a head and shoulder massage for a holistic relaxation experience. For a limited period only, ZuYue Foot Reflexology is offering 60-minute foot massage at $25nett. Normal rate for foot massage is $28 for 40 minutes and body massage is $28 for 30 minutes. To avoid disappointment, call 6758 6519 to book an appointment today. The outlet at Sembawang MRT Station (inside Station33) is usually crowded from late afternoon onwards. To celebrate the opening of this new branch, Luxe Women is giving free nail art (worth $20) with every spa nail service. Luxe Women is the first nail-trending salon and their specialities include Bridal Nails, Nail Arts, Art-Pro Nail Printing, Gel Polish, Embroidery Services and many more. Many thanks to Jac and the staff from Luxe Women and ZuYue Foot Reflexology for hosting us at the Blogger Party and special thanks to Mag Chow for the recommendation. This entry was posted in Fashion, Health and Fitness, Preview and Launch, Shopping, Singapore and tagged aroma scrub, art pro nail printing, beauty, blogger party, bridal nails, damien dominic wong, damien wong, don koh, don koh blog, donnlicious, embroidery services, foot massage, foot massage sembawang, foot reflexology, foot reflexology sembawang, free nail art, full body massage, health, jacuzzi foot bath therapy, Luxe Women, luxe women ang mo kio, luxe women branches, luxe women manicure, luxe women new branch, luxe women new outlet, luxe women outlets, luxe women pedicure, luxe women sembawang, luxe women yishun, luxewomen, mag chow, mag chow blog, manicure, manicure in sembawang, massage, modgam, nail arts, nail treading salon, nail trending, opening promotion, pedicure, promotion, sembawang, Shopping, station 33, station 33 sembawang, station33, station33 sembawang, style, uncle teh peng, uncletehpeng, zu yue foot massage, Zu Yue Foot Reflexology, zu yue foot reflexology sembawang, zuyue foot massage, ZuYue Foot Reflexology, zuyue foot reflexology sembawang. Bookmark the permalink.